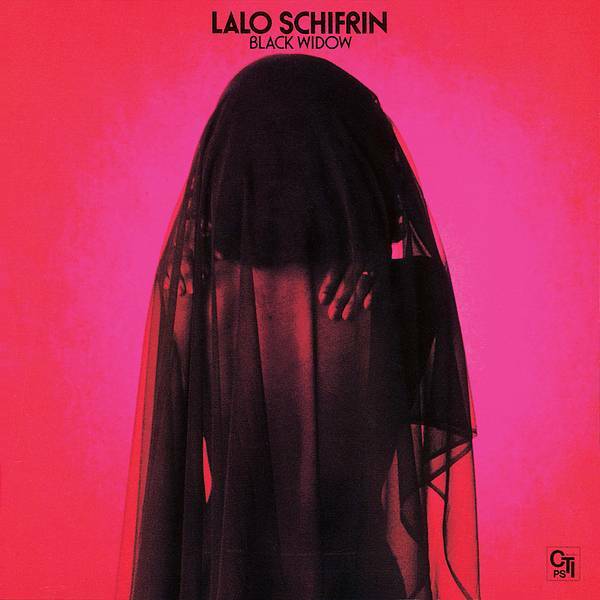 Black Widow is an album by Argentine composer, pianist and conductor Lalo Schifrin recorded in 1976 and released on the CTI label. Although he is best-known for film scores like Bullitt and Enter The Dragon, prolific composer Lalo Schifrin has always maintained a side career as a jazz musician. He racked up a massive success in this field in 1976 with Black Widow, a slick instrumental excursion that combined the musical dexterity of jazz with the dance-friendly rhythms of disco. This album found Schifrin turning his skills as an arranger and keyboardist to a set of material that matched up some unlikely but effective covers with a few originals. Highlights among the covers include "Quiet Village," which transforms the exotica classic into a slow-burning funk vamp dressed with plenty of spacey synthesizer, and "Moonglow & Theme From Picnic," which reworks these classic film themes by giving them keyboard-driven arrangements that are gently nudged along by an insistent beat. Black Widow also spawned a dancefloor hit with Schifrin's imaginative reworking of "Jaws," which transformed John Williams' spooky monster-movie theme into an ominous, percolating slice of nocturnal funk built on wah-wah guitar and Schifrin's elegantly jazzy keyboard excursions. In terms of the original tunes, the standout is the title track, a keyboard showcase that weaves surging strings around a funky bass groove that is fleshed out with all manner of synth and electric piano shadings. The strong disco edge to the proceedings may turn off jazz purists, but Schifrin's imaginative and stylish arrangements keep the music from succumbing to disco-beat boredom, and his expert backup band (including session stalwarts like Andy Newmark and John Tropea) attacks the material with energy and style to burn. The end result is one of the peak albums in Lalo Schifrin's lengthy catalogue and a necessity for anyone interested in his jazz work. Produced by Creed Taylor. Engineered & Mastered by Joe Jorgensen. Recorded on March 29 & 30, 1976 at Mediasound Studios in New York City. Conducted & Arranged by Lalo Schifrin.